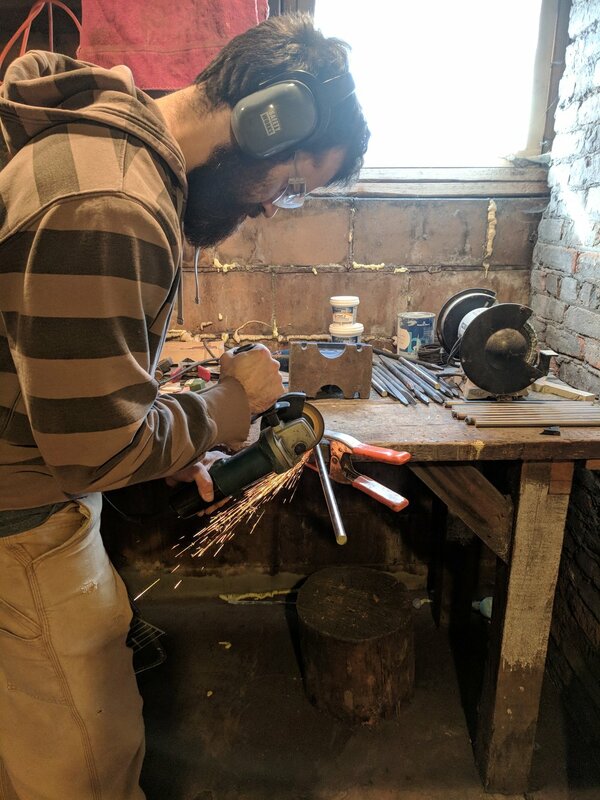 Jarrod and I were out at his mate's blacksmith shop working on turning hooks late last night, so I'll be writing about yesterday and today's apprenticing here. Yesterday I finished cutting up the three foot O1 tool steel rods into one foot sections. I did this by cutting a little over halfway through then breaking the bars with my immense manly strength. With all the bars cut to length I then had to grind off the rough edges. Leaving rough edges on when forging can result in them getting folded over leaving voids inside the steel. Best to get rid of them. I spent a little time working on spoons, and turned my bowl for the day. In the evening we headed off to the blacksmith shop. The shop belongs to Scott Roush, a friend of Jarrod's who generously gave us unfettered access for the evening. Jarrod has a small forging area in his shed which works for the occasional hook but we had 30 hooks to make. A large furnace and a power hammer would speed up the process considerably. 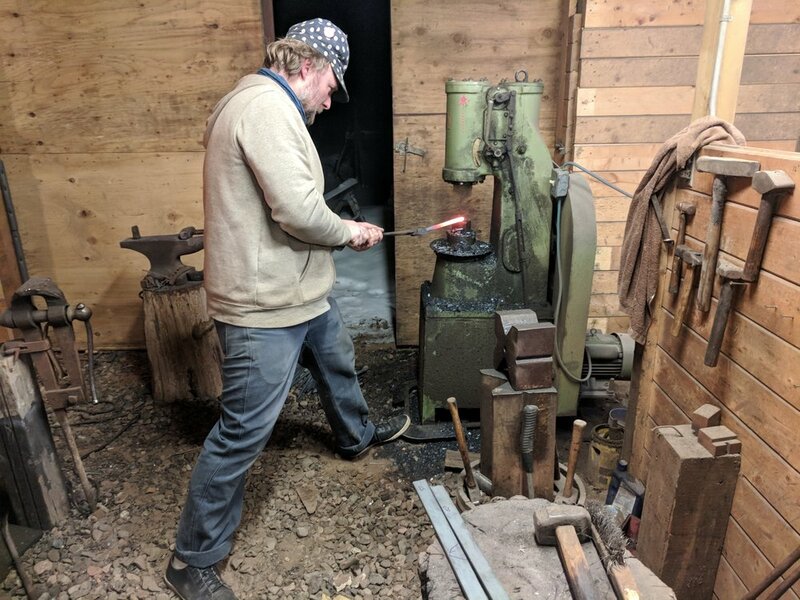 Scott had the forge running and the power hammer warming up when we arrived. The power hammer had been sitting cold for a while, so it wasn't up to full power when we arrived. Jarrod starting putting the steel rods in the furnace. After a little while, Jarrod withdrew a glowing red steel rod from the furnace. Looking like some Sith Lord who'd just fired up his red lightsaber, Jarrod swung the rod around and down onto the cube of steel that was the anvil. I just want to take a moment to pause here and try to convey all of the awesomeness coiled up inside that. If you put enough energy into a bit of metal, it emits light. This single fact is at the same day absolutely amazing and an almost everyday occurrence. As you know, incandescent lightbulbs work on that exact principle. A thin wire is heated until it emits the light that you might be sitting under right now. Knowing that is one thing, but seeing that same principle applied to a thick metal rod, seeing it glow, feeling the heat radiating from it, is something else. Striking while the iron was hot, Jarrod started to demonstrate how to create a tapered end that will fit into the wooden tool handles. He hammered out a few, putting more rods into the forge, flipping around the ones he'd worked so that the other end could be heated. Soon enough, the power hammer was up to speed and he moved to work on that, handing me the hammer and tongs. This was more an opportunity for me to get comfortable swinging a hammer at a glowing rod of metal. Jarrod didn't have much expectation that I'd accomplish much, which is great, as I probably made more work for him, than I completed. I was surprised by how difficult I found the experience to be. 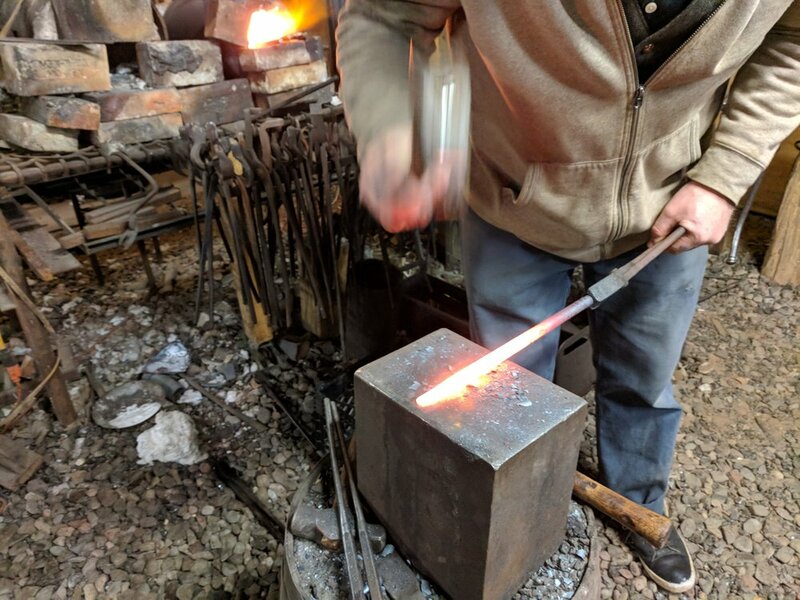 Gripping the tongs tightly (probably too tightly, visions of a molten steel rod impaling my foot swimming through my mind) and swinging a lump hammer was hard work. The muscles in my forearms quickly began to ache. I was surprised by this, as I expected swinging a hammer to be similar to swinging an axe. However I was standing further away from my work blacksmithing compared to the way I stand right over my work when carving. This slight change made a big difference. There was also a slightly stressful feeling of having too many irons in the fire. There's a constant time pressure that isn't there when woodworking. Pulling a rod out the forge, you need to whack it before it cools down too much. Hit too cold metal is not just inefficient but can result in the steel cracking. Spend too much time on one piece and there's the risk the others in the forge overheat. Once I had whaled on 10-15 of the rods Jarrod stepped into production mode. He'd spent a while working in a blacksmith shop, running a power hammer. So he got to work, going hammer and tongs, quickly bashing out the rest of the hooks. Jarrod had some other metal work to do. He had to make some pieces for his Japanese lathe. He had some flat rods of different length that he was working on in between the hooks. Early in the evening Jarrod took a short section of metal out the forge. It was completely red. He set it in a vice and gave it a sharp turn with his tongs, putting a twist in the steel. Seeing him do that blew my mind. The malleableness of the metal at these high temperatures was kind of unexpected. When he was hammering a longer rod into what looked like a steel boomerang, the first hammer strike had the steel deform only around the hammer. It's hard to describe, but when struck, this superheated steel didn't move in the way I would have expected it to. Previously Jarrod had warned me not to pick up anything in the shop without pausing to check it's temperature. He talked about the dangers 'black heat'. Again, this was something easy to understand in theory, but not properly appreciated until you see it in person. As mentioned above, I was awed by the glowing of the hot steel. We're used to red being used as a warning, so a literally red hot lump of steel is not something you'll mindlessly grasp for. But within a very short amount of time that steel will lose its glow. You can be left with an extremely innocent looking lump of metal that seconds early was glowing a warning. I can see how easily the unwary could get serious burns. 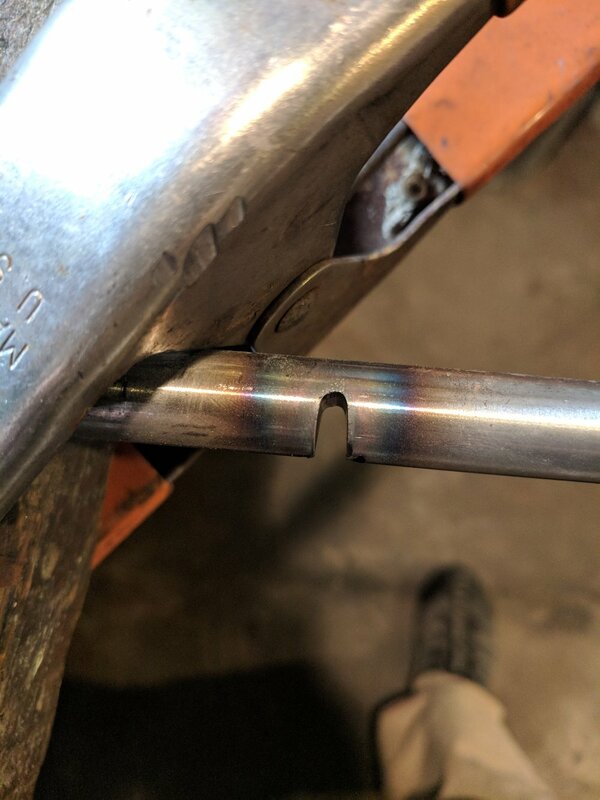 We used our time in the shop to just taper both ends of the steel rods. One end into a point for insertion into handles, the other end flat, ready for bending and shaping into hooks. We'll do the finer shaping and grinding at Jarrod's. 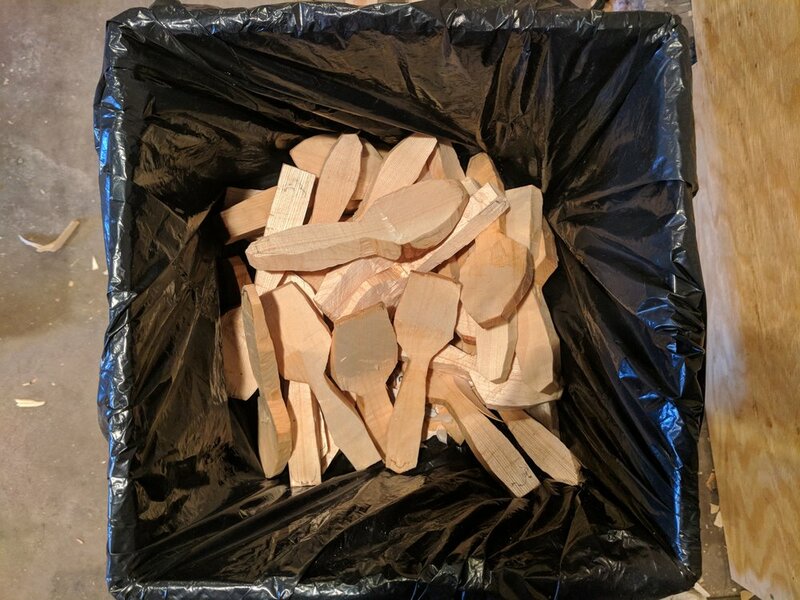 Today I spent the morning working through the bag of spoons I started. I got all 30 worked to the point where Jarrod can now draw a more refined design on them. When he's done that I'll use the new design to refine them further, mainly on the spoon mule. Tomorrow Jarrod is opening orders for Lamhogs. I think he's planning on a run of about 20-30. So I've started roughing them out. 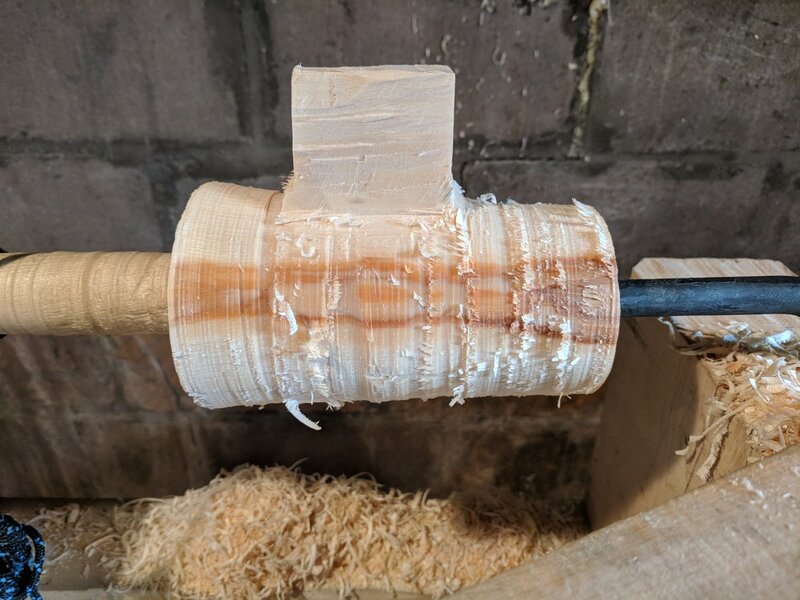 Similar to how my roughing out progressed with bowls, for now I'm just turning them to remove the axe marks, and doing a little hollowing. Eventually Jarrod will want me to start putting some shape into the cups, eventually working to a template. I roughed out two lamhogs today. I had a bit of a hard time getting a nice surface finish on the first. I don't want to hand over a piece with a shoddy finish, but it does reach a point where there's only so much wood left. I did a better job with the second one, taking my time, making smaller and slower movements with the hooks. I also did my bowl for the day. I turned another nested set, turning the core into a bowl as well.